Lupines are a group of perennial growing flowering plants that are easy to grow and maintain. 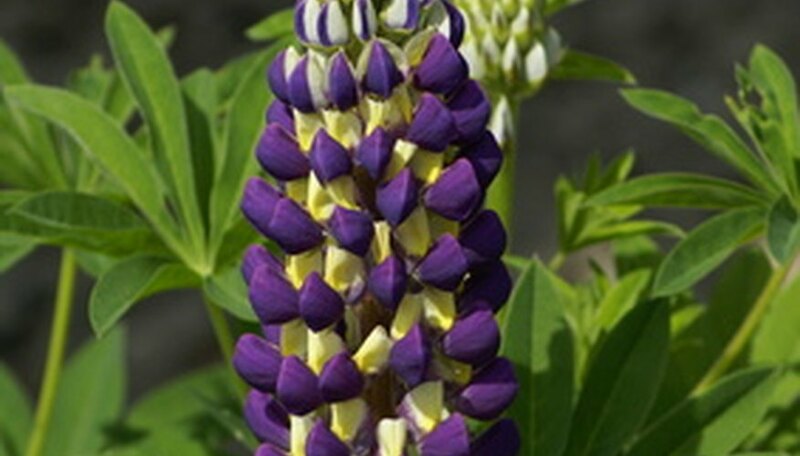 Although there are a number of lupine varieties you can grow, according toe BackyardGardener.com, the most popular species is the bigleaf lupine (Lupinus polyphyllus). This variety of lupine grows to between 3 and 6 feet tall, making it ideal for planting along fences, near driveways or as the centerpiece to any flower garden. Starting lupines from seed requires a little careful preparation beforehand. Lupine seeds are best sown directly into the ground to avoid damaging the long tap-root. Gather the dried seed pods from a lupine plant in early to late fall. The pods are ready to harvest when they are brown-colored and crack open when squeezed. Place the lupine seeds inside a canister or other lidded container. Store the seeds in a cool location until about four to five weeks before the last anticipated spring frost in your region. A good temperature to store the lupine seeds is between between 55 and 60 degrees Fahrenheit. Nick, chip or file off a section of the seed coat on each of the lupine seeds. You can use an emery board, a sharp knife or a utility knife to do this. Dampen down two paper towels. Lay out one of the paper towels flat on a hard surface. Place the lupine seeds onto the damp paper towel. Set the other damp paper towel on top of the lupine seeds. Fold up the paper towels into a square that is about 3 to 4 inches wide. Place the folded, damp paper towels containing the lupine seeds inside a zipper-style plastic bag. Seal the bag closed then place it into a refrigerator that is set to 40 degrees Fahrenheit. The bag should remain in the refrigerator for seven days. The cold storage treatment will improve germination rates. Remove the lupine seeds from between the paper towels after the allotted time has passed, and plant them directly into your garden. Locate a suitable planting site for the lupine seeds that is in full sun, to partial shade. Although lupine can tolerate full sun, it prefers moist, cool soil, according to The Lady Bird Johnson Wildflower Center. Cultivate the planting site thoroughly using a hoe to eliminate all weeds and their roots. Create 10 to 12 inch wide rows spaced at approximately 2 to 4 feet apart in the planting site. In the middle of each row, create 1/4-inch deep holes that are about 14 to 16 inches apart. Plant one lupine seed into each of the previously created planting holes. Cover up the lupine seeds with approximately 1/4 inch of soil. Then spray the entire planted area with a fine spray of water until you are sure the soil is moistened. Check on the site at least once a day to make sure the soil is staying moist. Use a garden hose and a fine spray of water when watering so you will not displace any of the seeds. Germination of lupine seeds will begin in approximately two to three weeks. Lady Bird Johnson Wildflower Center: Lupinus polyphyllus Lindl.